Here is the 2nd workout in this little mini-series. If you’ve been feeling complacent or not challenged enough in your HIIT training, this new workout will really require you to dig deep to get through without any extra breaks. You’ll want to keep perfect form from start to finish and see if you can keep up the pace as your sweat your way through! 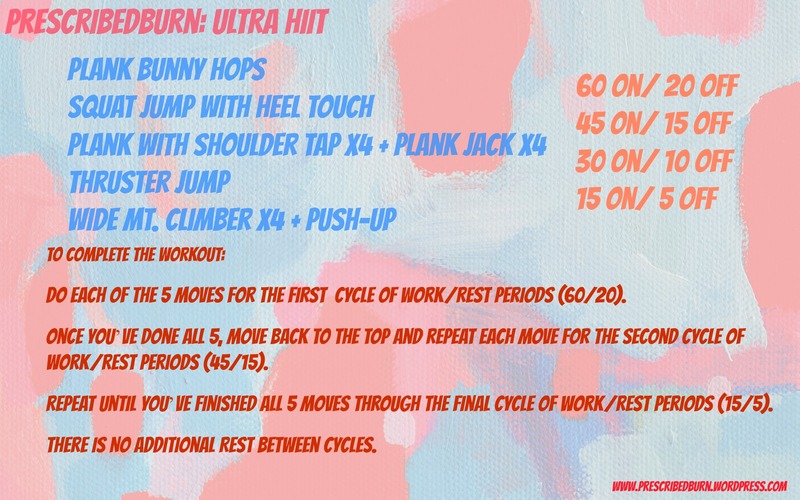 In the last workout, the challenge came from modifying rest periods, this time the work cycles will challenge your body – you should literally “feel the burn” when lactic acid builds in your muscles. The good news is with interval training, your body can become more efficient at removing the acid from your muscles during training, and you will become more comfortable (and even better) working for longer periods at a higher intensity. Here’s a new workout to get you going – I didn’t build-in any additional rest between rounds but listen to your body. Aim for perfect form from start to finish and see if you can stay at the same pace throughout. These body weight moves are particularly challenging, but the work periods get shorter so keep pushing through! To complete the workout you’ll do each of the 5 moves for the prescribed work/rest period (60/20). Once you’ve done all 5, move back to the top and repeat each move for the second cycle of work/rest periods (45/15), and repeat until you’ve finished all 5 moves through the final cycle of word/rest (15/5). Since there is NO additional rest, this means that when you finish your 60 seconds of Wide Mt. Climber/Push-up combo, you’ll get your 20 seconds of rest and then start back with 45 seconds of the Plank Hops, and so on until you’ve completed each move in each of the rounds. Not sure what each of the moves are? Demo videos and notes below! *From a high plank position, keeping both feet together hop them up and to the side, landing outside your hands, then hop back to a plank. Hop them to the opposite side. Repeat, keeping feet together the entire time. Try to minimize the amount of time you pause before the next hop and keep your core tight the entire time. Aim to get the feet directly outside your hands. *This move is essentially a regular squat jump except you’ll really need to jump high enough so that you’ve got time to tap your heels/feet together before coming back down for your landing. *Try to keep your entire body perfectly still. Just like in the video you should only move one arm at a time while your body remains in a perfect plank. To do this, move slowly and build up speed as you get stronger and more comfortable. In addition, focus on really squeezing each muscle from head to toe – glutes tight, inner thighs squeezed together, pushing down into the ground with your hands. Alternate tapping your shoulders 4 times, then once both hands are back on the ground complete 4 Plank Jacks. Repeat. *The only modification I would make to this video is to squat low enough that you touch the ground before you explode up (extending arms overhead). Repeat by landing light on your feet and squatting back down to let your fingertips touch the ground. *Scroll down and look at the one called “Lunge Mt. Climber”. This is what I’m calling a “Wide Mt. Climber”. Either way, get in 4 hops – that’s each foot touching just outside your hand twice, then jump back to a plank position. From there, complete one full push-up and go directly back into 4 more hops. Next Post HIIT Challenge – Happy Halloween!